Great in size and in reputation, Papantoniou Bakeries first began operating in the bakery and confectionery industry about 10 years ago. The company has a good foundation to stand on, secured by knowledge, passion and expertise. 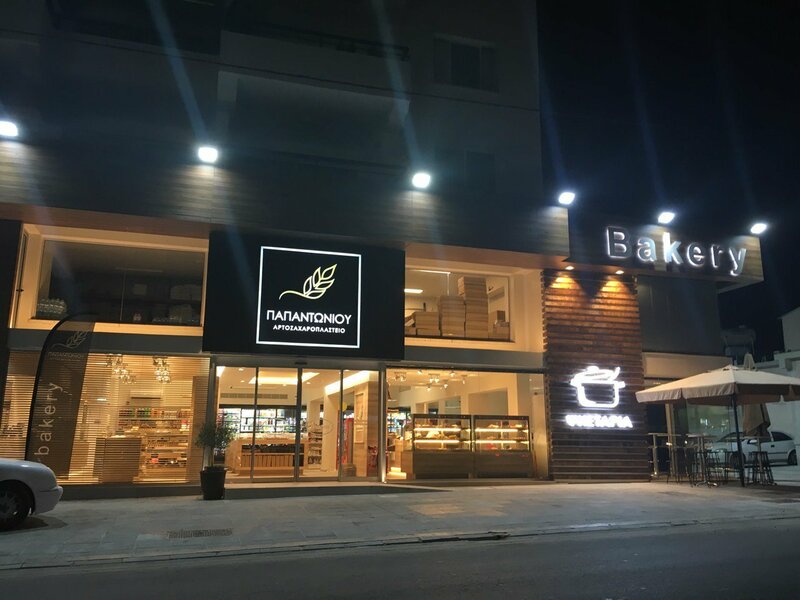 Once consisting of a small bakery shop in Kato Pafos, Papantoniou Bakeries quickly turned into a chain of bakery shops and has since been expanding rapidly, reaching a total of 12 shops in 2017, owing to the Management’s effective strategies and public confidence. Nevertheless, there’s more to our story. Our brand new 13th bakery shop is now open! You can find us at 75, Eleftherios Venizelos str., (Tel: 26-945777), 50m further down and opposite Coffee Island, in a state-of-the-art workshop equipped with cutting edge machinery that allows us to provide high-quality products to our customers with consistency and respect. Both the interior and exterior of the bakery feature a modern design and wooden details and are dressed in warm, earthy colours, inviting you into the ultimate bakery oasis. Our new bakery shop has ample parking for your best service, while in its interior space you can find everything you want in bakery and confectionery products and necessities! Papantoniou Bakeries also has a rotisserie with a great variety of healthy and tasty dishes from all around the world. Our delicacies and breads are prepared on a daily basis in our premises, with inspiration and excellent raw materials, to amaze you with their freshness and unparalleled flavour. You see, even though we have evolved into an established chain of bakery shops, we have remained faithful to the pure, traditional, human values of that small bakery that first opened in Kato Pafos. Enjoy freshly cooked homemade meals on a daily basis at the rotisserie of our brand new Papantoniou Bakery at 75, Eleftherios Venizelos str., 8021!